It all happened so fast. Before I realized what was going on, EELS bandleader E was headed down the steps into the crowd, giving out hugs like there was no tomorrow. “Go get a hug, Zach!” my dad told me. Being a well-behaved, obedient son (also full of delirious excitement) I shot out of my seat, quickly excusing myself as I maneuvered past the four people between me and the aisle. Somehow I landed in an empty spot just in time to get a quick hug from my musical hero. The Paramount in Austin is a magnificent theatre, beautifully renovated and the perfect venue to see The EELS perform in their current musical arrangement with upright bass, an assortment of percussion and bells, trumpet, guitar, pedal steel, melodica, piano and probably some other stuff I forgot. 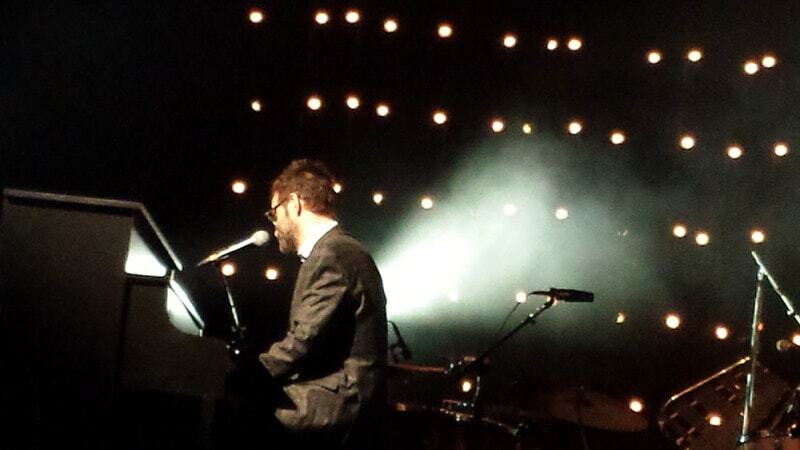 It seemed like an alternate reality version of EELS with strings Live at Town Hall, with its deeply personal subject matter and carefully crafted arrangements. With THE CAUTIONARY TALES OF MARK OLIVER EVERETT, E openly expresses his desire for others to learn from his mistakes, but there’s more to it than that. The album’s also about his family; “Parallels” could be about his dad or a failed relationship, and my dad astutely pointed out that “Gentlemen’s Choice” could be about E’s father and his then ridiculed – but now appreciated – many worlds interpretation of quantum mechanics. “Three Ghosts,” as E has said, is about catching up with his mother, father and sister. The EELS cover a lot of ground. 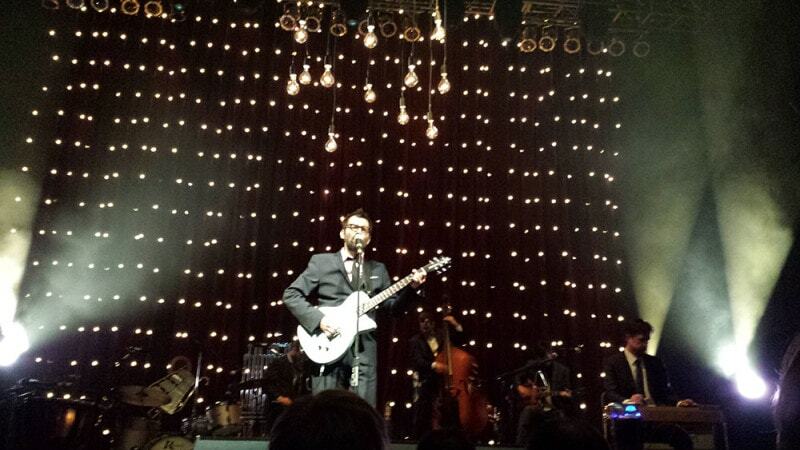 Carrie and I drove to Houston the next day to see The EELS at House of Blues. I was somewhat afraid of spoiling the magic of the Austin show, but it turns out that wasn’t possible. After checking into our hotel (we stayed a short walk from the venue), taking a nap (hey, we were up late celebrating), then exploring downtown Houston, we made it to HOB just in time to see EELS multi-instrumentalist The Chet getting into the tour bus. We had time to kill before the show, so we hung out outside the venue on the off chance of seeing more of the band. The Chet soon reemerged from the bus (no, we weren’t stalking him) and I took the opportunity to say hi. I told him I loved his work with The EELS and his reading of Things The Grandchildren Should Know, trying desperately to not make a fool of myself. He was incredibly friendly and took a few moments to chat even though he obviously had things to do. I didn’t get a hug from E that night, but I did get to meet The Chet, so the night had its own magic. The set lists for Austin and Houston were pretty close, maybe identical, although I don’t remember hearing “3 Speed” in Austin. They played two of my favorites from End Times (an apocalyptic break-up album), “Mansions of Los Feliz” and “A Line in the Dirt,” and what may be the saddest catchy song ever, “Last Stop: This Town” from Electro-Shock Blues. The live EELS experience was more amazing than I ever could have imagined. E’s sincerity didn’t falter for a second. He was full of jokes and in good spirits, even through a portion of the set he referred to as “bummer songs.” (He’s really good at writing those, but also really good at writing optimistic material.) People desperately shouted requests during their encore set in Houston (I even heard a “Free Bird”), and he said, quite sternly and matter-of-fact, “Not taking requests.” That’s how he works, and that’s part of what makes him such a fantastic artist. Posted by Zach Fountain in Inspiration on May 20, 2014 . This was one of those events I end up wishing everyone I know had been there for!